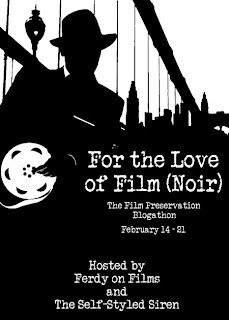 This review is being posted in support of the For the Love of Film (Noir) blogathon taking place this week. The event will be raising money to assist the Film Noir Foundation and Paramount Pictures in funding UCLA's restoration of The Sound of Fury(1950), featuring Lloyd Bridges. Please consider contributing to this worthy cause and saving a piece of history. Any amount will make a difference! For more information about the blog-a-thon, and to read the insane number of fascinating posts contributed by passionate film bloggers check out the Self-Styled Siren or Ferdy on Films. Sometimes murder is like love. It takes two to commit it: the man who hates and the man who is hated. 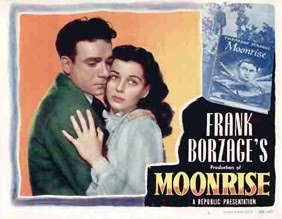 Director Frank Borzage’s Moonrise (1948) unfolds amid the swamps of a rural Virginia town, but it has the clockwork of a gritty city noir. This is primarily due to Dane Clark, in his role as Danny Hawkins, an angry young man who wears his noirish guilt like an itchy sweater, twitching and straining to avoid an unhappy fate. You could place him unchanged on a city street and his part of the story would still be plausible. But we are in the rural south, where Danny has been haunted and taunted his whole life over the hanging of his father for murder. The cruelest of the bullies is entitled rich kid Jerry Sykes (Lloyd Bridges), son of the town banker. Nothing changes when they reach adulthood, and one evening in the swamps behind a dance hall, the two men fight over dreamy-eyed Gilly Johnson (Gail Russell). The fight gets ugly, and Jerry makes an insulting gesture that he has been repeating since the death of Danny’s father. It causes Danny’s tormented past to flash before his eyes. When Jerry asks his breathless rival if he has “had enough” he has no idea what he has unleashed. Danny kills him with a rock, in self-defense, but there is angry passion behind the gesture, and he is horrified by his actions. Danny races through the night in a storm of guilt and horror, making everyone a victim of his turmoil, including his friend, the gentle, mentally-impaired deaf-mute Billy Scripture (Harry Morgan) and the baffled and frightened Gilly. His whirling rage ends in a rain-soaked car wreck, from which he pulls a limp Gilly with shame and regret. Danny is an orphan, and his guardian aunt (Selena Royle) does not know what to make of him. She twists her hands around her knitting as she tries to speak of her faith in her nephew, but she appears fearful that he has what she seems to see as his father’s angry blood. The location switches to a church scene, where Gilly also twists her hands anxiously, in torment over the angry man she adores. Though Danny frightens Gilly, she loves him more than Jerry. He seems to arouse in her an irresistible mixture of maternal and passionate feelings, even though she fears he could jeopardize her position as the town schoolteacher. They begin a private affair in a creaky abandoned mansion, and find that when they are alone, all is right between them. In the outside world, the rest of the townspeople seem a lot more accepting of, and less worried about Danny than he imagines. It seems that he has really only been the target of a few nasty boys. Everyone else speaks to him with ease, despite his visibly growing anxiety over Jerry’s body hidden in the swamp. He even impresses the quietly intelligent town sheriff (Allyn Joslyn) who invites him for a chat on a bench full of townies. Danny enjoys the company of the men, and particularly a practically deaf, but charming old-timer, but he never relaxes. His posture is tense and he keeps his arms folded tight across his chest. If anyone has noticed his anxiety, they don’t mention it. Perhaps Danny has always been this way. The only time Danny truly relaxes is with his African-American friend Mose (Rex Ingram), a loner who lives in a shack by the swamp. He has regretfully given up on the human race, tired of getting knocked around, but aware that he has taken the coward’s way out. Danny understands him and treats him with the respect of a kindred soul. When Jerry’s body is finally found, it is Mose who realizes Danny has killed him. The sheriff is not far behind, though he doesn’t want to believe the truth. Still, he must do his job and he pursues his investigation with somber dignity. He wants the crime to be about Jerry’s gambling debts, which he'd planned to cover with embezzled money from his father’s bank, but the clues all point to Danny. A surreal ferris wheel ride at a traveling fair confirms the sheriff’s suspicions. As they ride in circles, he watches Danny and Gilly with probing eyes and thinks he understands the passion that led to the crime. Danny watches the lawman hovering over him as if he is ready to pounce, and he becomes so overwhelmed that he leaps to the ground, blacking out. From then on, Danny is on the run. He starts his flight ready to fight to the death, sure of the unbeatable anger in his blood. His feelings change when he seeks sanctuary with his grandmother (Ethel Barrymore) who lives quietly near the swamp. She helps him to understand his father, who was not angry at heart, but rather fiercely protective of his family and happiness. Elated by his grandmother’s words, Danny decides he will no longer fight. He hopes for compassion, knowing all the while that he may be walking to his death. Moonrise is a strange hybrid of romance, mystery and small town drama. Sometimes it has the lush, nightmarish feel of Night of the Hunter, but it is not as jarringly surreal. Danny lives in a quiet, slow-paced world, but it holds menace for him. It isn’t until a symbolic moonrise that he finds a sense of peace in the middle of a dark, cruel night.